A professional manager must have suitable characteristics and qualities to be able to function effectively. The necessary knowledge and skills are built on these individual characteristics and their application becomes a competence. Their requisite balance and amount will vary from person to person and change with maturity, experience and, in certain cases, education and training. Businesses from manufacturing and service industries (including sectors such as leisure, hospitality, retail, banking, and so on) to the public sector (including government, charities, and so on) normally require competent professional management to succeed and be competitive. Businesses have aims and objectives. In general these are: To be profitable (value for money, if non-profit making) and to increase their market share. In addition, they are likely to aim at generating added value both for their customers and employees. Also, but not always, they seek to be well-respected and have a happy and harmonious workforce. To be a competent and effective manager it is necessary to demonstrate certain behaviour, knowledge and skills and to achieve agreed deliverables. These, collectively, can be called management competences. The diagram illustrates that management competency and performance are an integral part of the organisation’s value chain. It illustrates the framework that, in our view, forms the basis for measuring and evaluating the competency of Professional managers. 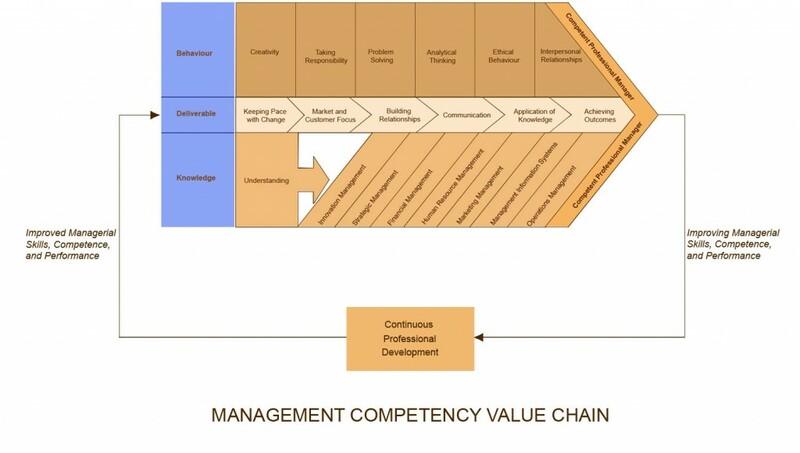 The competency value chain and its content will obviously vary from firm to firm, from industry to industry and from levels of management responsibility. Evaluation and assessment of managers can be applied at any level of management and for subsets of management activity. However, the competences as described have been prepared with senior levels of management in mind, pre-supposing that they can be extrapolated downwards in the management chain, albeit with a lesser contribution. The framework as illustrated be also be used as a basis for the design of practical management education and training programmes, for the identification of staff training and development needs to ensure that desired performance of the deliverables are achieved. Our Post Experience Qualifying Programme – PEQP – encompasses the elements of the framework and managers are expected to demonstrate their analytical, problem solving and communication skills within a work place environment. Completion of our programme forms the basis for further improvement through our requirement for Continuous Professional Development (CPD). To be a competent and effective manager it is necessary to have certain characteristics, qualities, knowledge and skills. These, collectively, can be called management competences and are described below. They can be used as a basis for the design of practical management education and training programmes, for the identification of staff training and development needs and for the evaluation of the competence and performance of professional managers. The latter evaluation can be applied at any level of management and for subsets of management activity. However, the competences as described have been prepared with senior levels of management in mind, pre-supposing that they can be extrapolated downwards in the management chain, albeit with a lesser contribution. Whilst competence is defined as 'the ability to do something successfully and/or efficiently', it is believed that any evaluation of management competence would be lacking if it did not recognise the potential for improving managerial performance. Many qualities are essential for effective management, for example, leadership and decision-making. If weak, some character building courses can strengthen and enhance them. Not all qualities and characteristics are easy to develop through education and training, for example, a good manager should demonstrate a good level of empathy in order to be able to relate to staff and customers and if lacking, it is difficult to improve. Be able to take charge of, inspire and influence others either individually, or as a team. Be self-motivated and be able to motivate others (also a characteristic of leadership). Be able to make carefully considered, but positive decisions. Be able to treat problems as a challenge, understand the full nature of a problem and develop strategies to reach a satisfactory outcome (also a characteristic of decision making). Be able to develop new concepts, apply them, adopt new ideas and think laterally. Have an awareness of the feelings and attitudes of the staff and customers. Have political sensitivity; recognise and understand the motives and objectives of others. Be able to initiate and manage change and be aware that the introduction of change often generates insecurity. Be accountable and responsible for actions and decisions. Generate a culture of accountability in others. Be able to collect, administer, apply and manage information. Understand and know what the business does, how it is structured, its markets, how it operates both short and long term, its management structure and culture, how it fits into the economy in which it operates and its operating relationship with its competitors. Know how to communicate clearly, persuasively and concisely in speech and in 'writing'. Understand markets, marketing principles, market research and competitiveness. Understand how to manage customers in order to best meet their needs and that of the business (CRM is also relevant to marketing). Have a knowledge and understanding of the application of technology in business, be able to apply it and have an appreciation of its current and future impact (this includes ICT). Understand the need for and the application of continual improvement to business processes and activities, the performance of managers and other employees. Be able to apply the philosophy and culture of Kaizen in its broadest sense, particularly in order to ensure the success and competitiveness of the business. Among other things, this embraces all staff development, performance management, quality management and personal development. Understand business finance and accounting principles, the management of budgets and forecasting, the nature of profit and loss and investment. Understand human resource management methods, trends, forecasts and legislation. Understand goals and targets, business plans and the importance of forecasts and their relationship with budgets and processes against a background of aiming for profitability and, or value for money. Understand and make plans for the possible outcomes of risks and crises. The management competences described above are neither exhaustive, nor fixed. They will vary and evolve to meet new business requirements and socio-economic developments and progress. It would be a rare professional manager who has all the competences shown. Consequently, the lists can be used to identify characteristics and qualities; knowledge and skills which are lacking, or nonexistent in managers. For example, a manager may need to strengthen leadership qualities and might be able to improve them by attending leadership workshops, or, if lacking marketing knowledge could attend a marketing course, and so on. In addition, the lists provide trainers and educators with the basic curriculum sectors and topics as a template to be able to design management courses and programmes. Inevitably, when evaluating competence in any human endeavour built upon characteristics and qualities, there is a subjective element which, when making comparisons and judgements, can lead to inconsistencies. The following process of evaluation aims at finding practical comparators which can provide a useful evaluation of professional management competence. It mainly relies on performance scores obtained from a self-assessment and at least two 'independent' evaluators. The process requires the 19 competences, namely, the nine under the heading Characteristics and Qualities in paragraph 8. (a-i) and the ten under the heading Knowledge and Skills paragraph in paragraph 9. (a-j) to be scored by the individual being evaluated (the manager) and at least two others. The two 'independent' evaluators must be persons who have a good knowledge of the manager, preferably current, or previous employers. The results from the scores enable a competency profile to be developed. The manager's self-assessment scores must be accompanied by a brief supporting statement for each competence justifying the score (for areas of knowledge, qualifications can be cited). A senior manager would expect to delegate activities to experts, consequently, he, or she could score quite highly on, say, marketing, or human resources through awareness of the requirements without being a 'practitioner' in the field. The outcome depends on a number of factors and the purpose of the evaluation, but should be concluded by a fourth party who considers the ‘reports’, the manager’s CV, job description, his, or her scores and those of the evaluators. First, if the evaluation is carried out for the purpose of licensing and certification then the licensing/qualifying body will have a clear idea from the information provided whether the subject is up to standard. Secondly, if the evaluation is carried out for the purposes of career development, the scores will provide information on areas of competence which are strong, or those which need to be strengthened. Some evaluations can be completed very quickly if bad scores show up for particular competences, for example, a manager must be deemed incompetent if a score of 3 or below is given for 8.a, or 9.a, as leadership qualities and business understanding are essential for any manager. The IPMA firmly believes that business profitability and competitiveness cannot be maintained without highly competent professional managers who continually develop and improve their managerial performance and competence. Further information about the evaluation of management competence, particularly for the purposes of IPMA licensing and certification can be obtained from the IPMA.